Susan B. Anderson: Two Books with Heart ~ A Double Giveaway! Two Books with Heart ~ A Double Giveaway! As a part of the Stitch Red campaign, a portion of the profits from this book will be donated to the Foundation for the National Institutes of Health in support of The Heart Truth® to help raise awareness of heart disease in women. We hope you'll join us in the fight against heart disease and in knitting red! The publisher, Sixth & Spring, and the author, Laura Zander (the heart and soul of Jimmy Beans Wool), have pulled together some of the top names in both the sewing and knitting industries for the books. Needless to say, there are wonderful designs in both books and many I would like to make myself. Click here for Jimmy Beans Wool and to see the Knit Red projects and designers. Click here to see all of the 31 Knit Red projects on Ravelry. Click here to see all of the sewing projects in Sew red. Click here to purchase the Sew Red book. Click here to purchase the Knit Red book. The books are beautifully done. The patterns and projects in both books have a huge range from clothing, accessories, home goods and more. The photography is perfection and has the sewer and knitter in mind at all times. It is very clear. There are two specific projects that I am going to knit from Knit Red. The photo above is a cardigan style that I just adore. It is simple and practical and pretty. I am going to knit this hoodie in a beautiful red Valley Yarns worsted weight wool that I have in my stash. 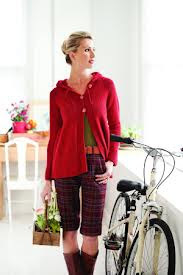 The cardigan is called the A-Line Hoodie and it's designed by Diane Soucy. Click here for the Ravelry page for the A-Line Hoodie. The Cowl Neck Vest is another project from Knit Red that I am going to knit for sure. I think it is so cute. I have some Dream in Color worsted weight (in a variegated green) in my stash that will be perfect for this one. I love the designer, Cecily Glowik-MacDonald. She never misses. Click here for the Ravelry project page for the Cowl Neck Vest. Plus I always love pockets, don't you? Anyway, both books are winners not only because they do some good by donating part of the profits to a women's heart health organization but also because they are so well-done and beautifully crafted. Plus both books have versatile and varied designs by top designers in their fields. It's a win-win for all. To enter to win a copy of either Knit Red or Sew Red please leave a comment on this blog post. Please leave only one comment, specify which book you are interested in or if you are interested in both of the books. Also, please leave your email or rav id so I can get in touch to get your mailing address if you should win. I will be back in a couple of days to randomly select two winners, one for Knit Red and one for Sew Red! Good luck and let the comments begin! Oh, how to pick?! I'd love to have either book. These both look wonderful. Thanks for the chance to win! What a great way to help the cause.. Please enter me in the drawing and I will be happy with either one of them. Would love to win either book! Thanks for the chance. I would love to win Knit Red. Thanks! Thank you! I would love to knit the A-line cardi as well and have the Knit Red book. I have the Knit Red book, it is wonderful! I'd love to win either book! The Knit Red book has been on my wish list for a while now - would love to win! Wow! I've had my eye on the Knit Red book for awhile and would love to win it. Both books look awesome...i think id prefer the knit red but its hard to tell. Once again thank you for your generosity. Red - my favorite color!!! I'd like Knit Red. Hi Susan! Enjoyed both of your classes at Spring Fling very much! I would be interested in either book. Hi Susan! Very much enjoyed both of your classes at Spring Fling! I would be interested in either book. Both books look great. I'd like the knit one of course but I could always give the sewing one to my grandma! Thanks for the fun giveaways! Hi Susan! Very much enjoyed both of your classes at Spring Fling. I would be interested in either book! Both books are lovely but my first choice is the sewing book. Thank you for a great give-away! Both books look awesome and I would love to win either. But I think i would get more use out of the knit red. Beautiful designs. Thank you so much for the chance to win!!! Love both of them! I personally would take the Knit Red, but would gift the Sew Red to either my sister or mom as they are excellent quilters! Thanks for the opportunity. CallieP on Ravelry. I would love to win Knit Red! I would love either one of these since I knit and sew! thank you!! I would love to have a copy of Knit Red! I've looked at Knit Red a couple times in the past - I am definitely adding it to my books wish list now. I would love the knitting book, thanks!!!!! I'd love the knit red book. I've been coveting it since it came out! madmartiknits on rav. Another great giveaway! Would love the Knit Red book! Wow, another great giveaway! Would love the Knit Red book! I would love either, but Knit Red is preferable. Love that cowl vest. Thanks for the giveaway! Would love either book, but the Knit Red would probably get more use by me. Thank you for the giveaway! Would love to have 'Knit Red', even have some red yarn on hand. I've been eyeing Knit Red for a long time now. The winner will be very lucky! Oh, I'd like either one. Zhanks for the opportunity! What a great pair of books! Thank you for the review. Either would be perfect on my bookshelf. Love the knit Red.... the sweater is darling. I would love the chance to win either. What a great way to support a cause! The Knit Red book looks wonderful. And red IS my favorite color! What a great book and way to increase awareness of heart disease. My preference would be for the Knit Red book. Thanks for the giveaway. What a fantastic give away. I have a desire for for the "Knit Red" as I have looked at it several times on Amazon. Thanks for offering these great book, Susan! Love the books, but I'd prefer the Knit Red. Thanks! I would love to have either book. I know there are knitting projects I would like to do in the one, and could use some sewing encouragement from the other. Both are lovely though my preference is the Knit Red. Rav ID is theferret. How nice to do this! I would love the Knit Red book. Thanks! Lovely books for a wonderful cause. My preference would be Knit Red. Would love to win either book as they both look wonderful. What a fun way to raise awareness and knit! I love both books! Thanks! I would LOVE to win Knit Red!! It looks like such a beautiful book!! I am NanaKnitz on Ravelry. would love to win the knit red book. Thank you so much for this great chance! I would love to win the "Knit Red" book! I really like that cowl vest! Thanks for the chance to win, Susan. Would love Knit Red... and I agree, Cecily Glowik MacDonald never misses! I've been eyeing the Knit Red book for a while. Just bought 7 skeins of Malabrigo Ravelry Red so I'm ready to start! As a knitting and sewer, I'd love to win either! Both books look fabulous and my first choice would be "Knit Red." I would love to have either of these books, sewing or knitting. Thanks! Would love to knit red!!!!! Would love to knit red! These both look like great books! I'm more of a knitter so Knit Red would be my preference. Thanks for hosting the giveaway! What a great cause! I would love to knit the Infinity Lace Scarf and the Cowl Neck Vest. I imagine if my name isn't chosen I will be looking for the Knit Red book at my book store! Meagan, ravID: mradford. I would love to win the KNIT RED book! Thanks for another great chance to win! I would love the knit red book. I never did learn to sew. I am grammacher on Ravelry. Both books look great and since I knit and sometimes sew either is a winner with me. Thanks for the giveaway! I sew and knit, so either book would be lovely. Thanks for introducing them to us! Thanks for the great giveaway! I would love to win the Knit Red book, have heard so many good things about it thru several podcasts. I mainly knit but have recently started to get back into sewing, so I'd love either book! Wow, what fantastic books, I would love either one! I have the Knit Red book and love the patterns. I already have socks on the needles from that book. 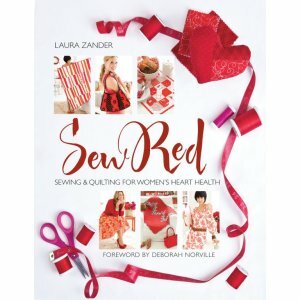 I would love to have a copy of the new Sew Red book! I/ already own Knit Red and it is fabulous, so I'd love to own my own Sew Red as well! Both books would be a pleasure to have. Thanks for another great give away. I would love to win the Knit Red book. Knit Red is on my wish list! Thank you for the chance to win! I'd love the Knit Red book! I love that a-line hoodie, too! What a fantastic giveaway! I'd love to win the knit red!Thanks for the chance to win. I really like that a portion of each book goes toward such a good cause. I would love a copy of "Knit Red." I want to knit the hoodie and the socks, for starters. Both books look great but I am further behind in my sewing than my knitting at the moment. I'd love to win a copy of Stitch Red. Thanks for bringing this to our attention. I was not aware of the campaign to raise heart health among women. It's a great cause. What a great cause! Would love to win either book, they both look wonderful. Thanks for the chance and for letting us know about them. Either book would make my day! My favorite color has always been red! Thanks for the opportunity. 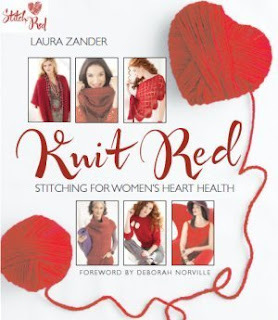 Since I purchased the knit red I would love a chance to win the Sew Red book! I was just at barnes & noble and it was a toss up between Knit Red and Topsy Turvy....Topsy Turvy won! So winning Knit Red would be awesome! Thanks for the chance Susan. Would love to win the Knit Red book. Thank you for the great give away!! Great cause! I'd love either book. Thanks for the chance. What a wonderful cause. I would love the knit red book. Another great giveaway! Love to win either one. I would love to check these books out! I love Jimmy Beans! Either book would be great, but if I had to choose, I think I'd pick the sewing book! I love just about everything in the Knit Red book! I would be interested in the Knit Red book. I would love to have Sew Red! I am Mahgret on ravelry. I love them both, but I would probably select the knit red book. I love to knit and to sew, so either book would make me happy! I would be thrilled to win either of these books! Thanks for yet another opportunity to win something fun! Both books look wonderful! I would really like to win the Knit Red Book! Thanks for the opportunity. My preference would be Knit Red, Susan. Great books and nice give-away. Thank you. Either book would be just fine w/ me! I think I'd love them both. Thank you for the great give-aways you have! I'd love either of them! I would love the knit red book! Pattytrish on Ravelry. I would love to win the knit book. I love that a line hoodie which would look great on my figure. Berryqueen on Ravelry. Knit red looks like an awesome book! love the knit red book. i love the a-line hoodie. thanks for the chance to win! Hi Susan-- They both look like fun! Thanks, as always, for blogging and for the chance to win! What a great idea! I would love the knitting one. I have had this on my Wish List for a long time! never tried to knit anything on my own from a book and i think i can do this!! i would LOVE to win a copy of knit red- never made a project from a book, on my own...this will be my first! a friend just brought knit red to our knit nite a couple weeks ago.....i'd love to own this one!!!! What a beautiful offer! I love the concept of the Knit Red and Sew Read books. Definitely want to knit the vest you plan to knit. Thank you for this opportunity. I'd love to win Knit Red. Would love to get my hands on the Knit Red book. Gorgeous! Would love to win Knit Red! I was noticing in my closet today how many neutrals I have. Really could use a pop of color! I would love either copy!! Thanks for the opportunity to win. Would love to win Knit Red! Would love to win either one of them! I'm going to check out the cowl hoodie on Ravelry--so cute. Wow, both books look awesome. I'd love to win either! Knit Red sounds great and I love the cause and Jimmy Beans. Knit Red, Knit Red, KNIT RED! Thanks! I would love to win a copy of either book. They both look fantastic! Thank you Susan for hosting such a wonderful giveaway! I'd love to have knit red! I am so glad I found your blog! I just love your patterns and all the beautiful stuff you make. Oh and those books look pretty cool too! I'd be thrilled to win either book. I would love to win Sew Red! I already have Knit Red and love it. Thanks for the wonderful giveaway. I'd love Knit Red. I like every pattern, and would have trouble choosing where to begin. I would LOVE the Knit Red book. Looks like another great one. Thanks for the opportunity to win it. I would LOVE Knit Red! I had congestive heart failure when I had my baby in September and love this cause! I would love either book! They both look inspirational! I am more of a knitter, so I would like Knit Red. You are the best! Both books look inspirational. I would prefer Knit Red. Would love to win either of this wonderful books! What beautiful books and patterns. I'd love to have Knit Red! I would love to get either book as red has always been my favorite color! They look fabulous. I love these books. Would love the Knit Red book! I would be happy to win either book. Thanks for the chance! I would gladly accept either book. Thanks for the chance! chosen, you pick the book. I also shop on Jimmy Beans and they have always been so nice. P.s. love the candy they send with your order! Both of the books look wonderful. Knitting is my first love, but I just had my sewing machine overhauled, so either book would be great! What a good cause! Heart disease has affected so many. I would be thrilled to win the sew red book as I am still just a beginning knitter. I'd love to win Knit Red. The color is so lively! Hi. I would sew or knit from either book. Thanks for highlighting them as I want to see about getting at least one. I would love to support the Heart Truth program this way. I was just diagnosed with a heart problem a few months ago, so both books are near and dear to me! Thanks to all who support the cause by the purchase of these books! I would love knit Red. Winning the Knit Red book would be great. Thanks. I want to knit that Cowl Neck Vest too! I would love either book. Thanks so much for the chance to win! RAVid- 4girlknits. I love the knitting book, but I am a seamstress so either would work. Thank you for the chance. Red is Best....and the knit red book would be my favorite! I would love to win the Knit Red. What a wonderful giveaway. Red is Best...and the knitting red would be even better. Thank you. Sue Cutt on ravelry. Wow, either of these books would be great. Looks like fun projects. Thanks for the chance at these. What a great cause! I would be so happy with either book.